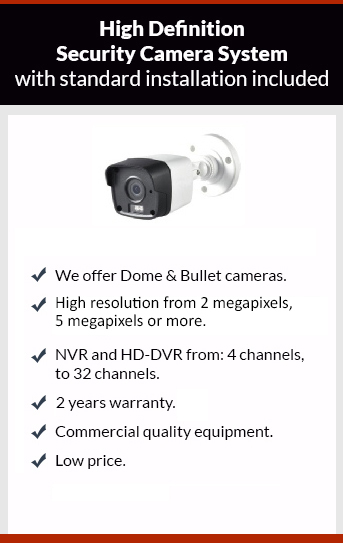 Get affordable Security Camera installation on Garden Grove, CA and CCTV equipment with commercial quality and 2 years warranty. Keep an eye on your home or business remotely and keep them safe with well-placed security cameras. Protection4less offer you the best technology, and the best installation to keep your peace of mind. We can offer you a long range infrared security camera, with the new matrix infrared the picture at night will be amazing on black-and-white. When the amount of light drops the camera has a light sensor which automatically switches the security camera to infrared mode. Matrix IR does more than conventional IR camera: The matrix IR security camera covers a bigger area than conventional IR. The standard resolution of all our cameras is 2 megapixels (1080p), and we have the latest technology with 4 megapixels (4K) resolution with incredible price. We offer only commercial quality security camera systems; this is not the same camera that you can find in a retail store. It’s a camera with high quality components that can last years without issues. The low price is the main customer’s reason to buy a product, but cheap products don’t last too much time. This makes the product expensive in the long run, because you have to repair it once in a while. With our quality products you don’t have to worry of this issue. The prices of Protection4Less a very competitive, give us a call to get your free estimate.